FREE GIFT: Receive a free Trilogy Exfoliant ( $39 value) when you come in for any of our advanced facials which include: Detox Cranberry Facial, Anti-aging Blueberry Facial and the Purifying Pumpkin Spice Facial. Please Note – Gift card deals cannot be combined with current facial promotions. Enjoy complimentary champagne and delicious bites. Watch a live airbrush tanning & skincare demos. Receive exclusive discounts, gift with purchase offers and more! Rejuvenate will be unveiling their beautifully gift wrapped Limited Edition Trilogy beauty kits ( $15-$32 retail value) and Holiday Gift With Purchase offers! 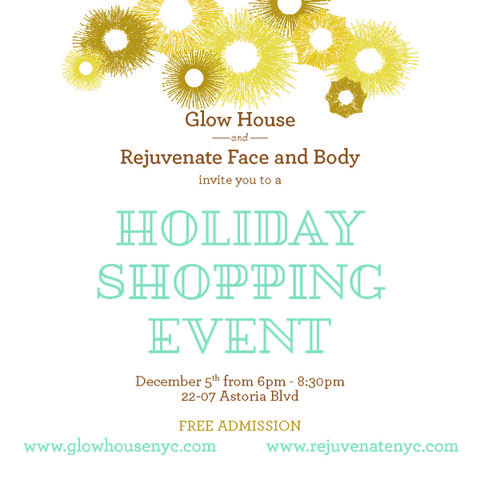 RSVP to maria@glowhouse to enter a raffle ($150 value) for the chance to to win a perfect-for-the-season blueberry peel + tanning session.